Rev Fran: "Becoming the Pentecost Church." A Sermon from Littlefield Presbyterian Church on Pentecost Sunday. "Becoming the Pentecost Church." A Sermon from Littlefield Presbyterian Church on Pentecost Sunday. On Pentecost, the disciples were gathered together in Jerusalem. It was 50 days after Jesus was raised from the grave., waiting and hoping for the fulfillment of Jesus’ promise-- the promise we heard last week: “You will receive power when the Holy Spirit has come upon you. And you will be my witnesses in Jerusalem, in all Judea and Samaria, and to the ends of the earth. What was it that happened on that Day of Pentecost? 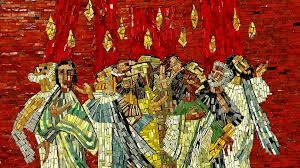 Pentecost is the story of how the church came alive by the power of the Holy Spirit. On that day, followers of Jesus Christ received the power to take the gospel to the streets there in Jerusalem... and eventually throughout the earth. What happened that day was such a powerful experience that the people who were there had to turn to dramatic metaphor to describe what happened. They said it was like a fire falling on them. On that day, a mighty wind from heaven blew the fire of the Holy Spirit into those followers who were gathered together. When something like tongues of fire danced over the heads of the apostles, they seemed to be quickened by unseen forces. They were shouting... preaching... speaking in a variety of languages so people from a lot of different countries could understand each other... and generally making such a commotion that the people of the city had to stop and wonder: what on earth was going on? The Spirit blew into the apostles an awareness that-- just as Jesus had promised-- the presence of the Holy Spirit was with them… and was at work in and through them. One way of understanding what happened at Pentecost is as a reversal of the story of the tower of Babel, as told in the book of Genesis. In the biblical memory, all the people in the world--the world known to them-- spoke a common language. According to the story, this unity of language and of culture was a dangerous thing. Because they could understand each other, the people gathered in one place and decided to build a city and a tower with its top in the heavens. They wanted to “make a name for themselves. They wanted power. Biblical scholar Robert Williamson suggests that when the people first began to make the bricks and mortar, there wasn’t really a plan to build a tower. Only after they’ve been laboring to make bricks is the decision made to build the tower. What did they think they were making bricks for? Maybe some thought they’d be used to build houses so that everyone would have shelter. But then the plan emerged to build a tower upward toward the heavens. Williamson suggests--rightly, I think-- that towers are part of a hierarchical way of being in the world. Not everyone can live at the top of the tower, in the penthouse. Not everyone can reach for the heavens. Most have to remain below. Some have to keep making bricks. Some have to grow the food to feed the privileged few at the top. Those at the bottom of the tower become the subjects of those at the top. The story of the Tower of Babel illustrates the human tendency to build upward, for some to elevate themselves at the expense of others. It lays bare the desire of some to be like gods. So, God scatters the people across the face of the earth and mixes their languages so they won’t be able to understand one another. This is the way the ancient text in Genesis explains the origin of different languages and cultural differences. I hear an echo of this scattering in the birth story in Luke’s gospel. On the day of Pentecost, the Spirit blew into the apostles an awareness that-- just as Jesus had promised-- the presence of the Holy Spirit was with them… and was at work in and through them. The disciples were filled with the Holy Spirit and began to speak in other languages, as the Spirit gave them ability. There were devout Jews from every nation staying in Jerusalem. When the crowd heard the disciples, they were bewildered, because each one heard the speaking in the native language of each. They were amazed and astonished and asked, “Aren’t they all Galileans? How can we be hearing in our own native languages? What does this mean? The sound that came from heaven-- that rushing violent wind-- was the exciting sound of old barriers being broken and glass ceilings shattering. The divisions within humanity were being overcome. The church was empowered to take to the streets with the good news. I think this is an important and relevant word for us today. In this time of divisiveness and polarization, this is an important and life-giving message. The other one was a commentary from Lawrence O’Donnell that I saw on the internet, as I don’t have cable. O’Donnell explained why he believes Christians have to choose between the words that dehumanization and hatred and the words of Jesus Christ. This piece began as a commentary and ended up being more of a sermon. He talked about what he learned in his Catholic school education. He pointed to “terrible perversions of Christianity” in history and held them up to the light to the teachings of Jesus Christ. I won’t say more about what he said. You can follow the link I shared and watch it for yourself if you want to. I responded by saying I’m sad that so many people close their minds to hear perspectives from people outside of their bubbles. There are times when people I respect and care about share links and perspectives from sources I may not hear frequently, and I try to listen and learn, to understand them better, even if I don’t necessarily agree. And sometimes I hear something we can claim as common ground. I really believe this. I believe the Holy Spirit empowers the community to embrace differences. As Robert Williamson says, “When the Holy Spirit wants to build a church, she begins by restoring the people’s capacity to understand each other. She enables people to speak across differences in language and custom.” The Holy Spirit creates a church that respects and embraces the cultural diversity of people--all people. According to the prophet Joel, the Holy Spirit doesn’t believe in hierarchies. The Spirit comes upon all people-- both men and women, young and old, slave and free, from all peoples and language groups and cultures. The Holy Spirit is in the business of building diverse communities of resurrection life. Our mission in the church today is to radiate the gospel of Jesus Christ… the resurrection power of new and abundant life for all, beginning where we are and reaching out to the ends of the earth. The Holy Spirit has been on the move, and we need to catch up with the movement of the Spirit. We have been promised that we will be given dreams and visions and the power to carry out God’s mission in the world. The book of Acts tells us that on the day of Pentecost, the disciples acquired a holy boldness that they’d never had before. I believe it can be so for us today. I believe it must be. The church needs us to dream God’s dreams and to live out God’s visions. The world needs it. We can get discouraged if we focus on the divisiveness and injustice and meanness we see in the world around us, if we don’t hold fast to the vision of our faith--the kingdom of God--and how the world can be when we live in the way of love. If we pay attention, we can see glimpses. Last Monday, Christians, Jews, Muslims, and people who don’t profess any formal religious affiliation gathered at state capitols around the nation to advocate for poor and marginalized people because they believe in the dignity of all persons and that everybody in the richest nation in the world has a right clean water and adequate food and housing and a good education. There is power and joy in working toward that vision together. I think there’s a real longing to live in a more merciful and just and inclusive world. Many people who didn’t think they had any interest in getting up early to watch the royal wedding of Prince Harry and Megan Merkel were drawn in by the coming together in marriage of the prince and a bi-racial American, some of whose ancestors were slaves. The Archbishop led the service, and American Presiding Bishop Michael Curry preached, which ended up being the most tweeted part of the service. People have been sharing his sermon through social media, and the text was printed in the New York Times and elsewhere. It reminded me of how, in another time, city newspapers would print the sermons from the major churches in town. Bishop Curry, a descendent of slaves, preached: “There’s power, power in love….I am talking about some power. Real power. Power to change the world…. power to transform…. Bishop Curry was preaching to millions of people around the world when he reminded us all that Jesus said the first and greatest commandment is to love the Lord your God with all your heart, all your soul, all your mind, and all your strength, and that the second is like it--Love your neighbor as yourself. Bishop Curry said, “Think and imagine a world where love is the way….Because when love is the way, we actually treat each other like we are actually family. When love is the way, we know that God is the source of us all. And we are brothers and sisters, children of God. My brothers and sisters, that’s a new Heaven, a new Earth, a new world, a new human family…. The feast of Pentecost reminds us that the Holy Spirit still blows into our lives, to justify us by grace through faith, to set us free to accept ourselves and to love God and neighbor. gave birth to the church continues to prod, cajole, and urge us forward. It’s been this way since the beginning of the church and will be this way as we are urged forward to live into God’s vision, until no child goes to bed hungry, until all God’s people are treated with dignity and have the basic necessities like safe water to drink and decent housing and a good education. Brief Statement of Faith of the Presbyterian Church (USA), 1990.